HEALTH Minister Aaron Motsoaledi and Afrocentric Group chairwoman Anna Mokgokong opened a new chronic medication distribution centre yesterday. The centre aims to create about 4 000 jobs while making it easier for patients to receive pre­scription medication at clinics, hospitals, pharmacies and even schools and churches. 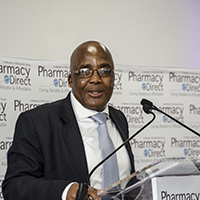 At the opening event held in Cen­turion, Tshwane, Mokgokong said Pharmacy Direct's Central Chronic Medicine Dispensing and Distribution Centre would be used to distribute chronic medication in KZN, Mpumalanga, Northern Cape and Limpopo. The warehouse and the increase in pharmacy Direct volumes by 50% will help to create at least 4 000 jobs during the next 12 months," she said. The warehouse could provide ac­cess to quality health care to 1,1 mil­lion patients," she said. "Many people in these provinces have been forced to travel to faraway clinics, only to be turned back because of the overwhelming numbers seeking help at these facilities. "In the past, far too much emphasis was put on addressing the needs of peo­ple in urban areas, while those in rural areas were completely neglected." Mokgokong said Pharmacy Direct was already packaging 40 000 parcels every eight hours. Motsoaledi said he was pleased with the new warehouse and believed such programmes were needed in Mzansi. "Such infrastructure is important as it helps us deal with the health prob­lems we are facing," he said.